The learning experts at Super Duper Publications know that teaching is an important but sometimes-difficult job, which is why they are fully committed to providing the best secondary and elementary teacher resources, featuring fun learning materials that children will love. Their catalog delivers the teaching aids, tools, classroom supplies and materials that teachers and special educators want and need, featuring new and creative activities for teaching vocabulary, reading, math, phonics, critical thinking, and specific learning materials designed for children with special needs. 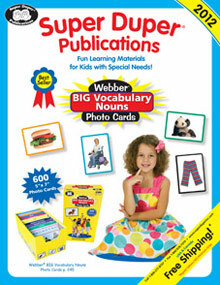 Whether you are a homeschooling parent searching for curriculum, a special needs educator, speech pathologist or elementary classroom teacher trying to meet the needs of your unique students, you can count on the Super Duper Publications catalog to have the materials that will help your students grow. From the newest phonics reading programs to classic math games, Super Duper is there for all your educational supplies needs.